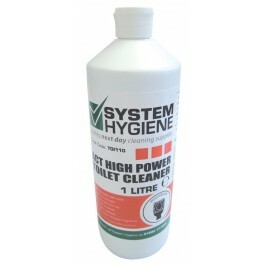 System Hygiene Act is a tough working and easy to use, stainless steel safe, toilet cleaner and descaler. The viscous formula clings longer than regular toilet cleaners for a more thorough cleaning action. The concentrated formulation liquid lavatory cleaner also effectively removes limescale and organic deposits, whilst also being excellent for cleaning and de-scaling washroom areas. REGULAR CLEANING: Apply the toilet cleaner evenly above the water line and around the bowls rim. Leave for approximately 10-15 minutes before flushing the toilet to rinse.